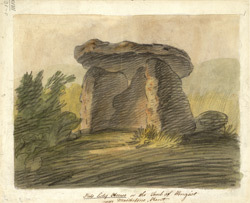 A watercolour and pencil drawing of a stone tomb, in the parish of Aylesford, Kent. This was also known as Kits Coity House. It is a megalithic burial chamber. As the drawing shows, it has three upright stones and a huge capstone on top. This burial chamber was originally covered by a long barrow (ancient mound of earth) which was there in the 18th century and was recorded as being 200 foot long. This chamber was in the south east part of the barrow. By the time this drawing was taken, the mound must have been excavated.